How can you correct Truss Uplift in a vaulted ceiling in a ranch style home? Hi Stewart, thank you for your question. We usually design all of our joinery on a case-by-case basis, as there are so many factors that go into a sufficient answer (i.e. uplift force, species, grade, spacing, etc.). That being said, Simpson Strong Tie makes a full range of tie-downs for a variety of uses. If you check out their website and look under “hurricane ties” I believe you should find what you are looking for. They also make a straps that can run along the exterior of the truss and down into solid blocking in your wall, with varying capacities. Just make sure that whatever you are connecting to underneath the truss is adequately restrained at the foundation level (Simpson could also serve this connection). 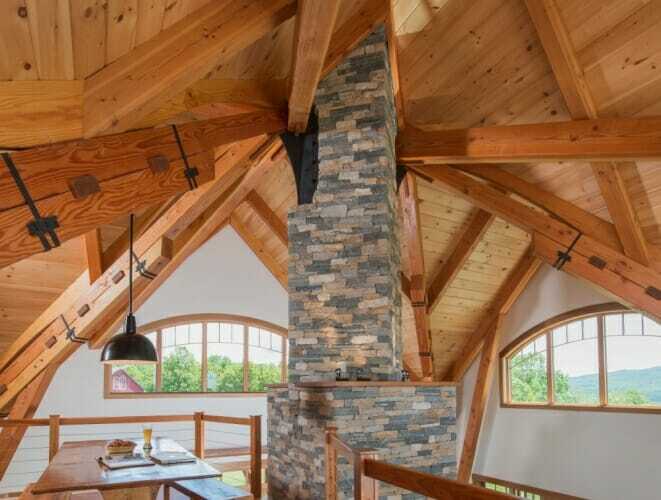 If they are visible timbers that you are working with and you want an internal mechanism, you could try a connection called a Timberlinx – basically it is a slotted rod with a pin that expands, and works fairly well in tension. You could mount the rod into your eave plate, and run the pin into the rafter. You can then plug the drilling so it has the appearance of a traditional joint. Either way, hope this helps!